Scare away burglars and other unwanted intruders with the SL-126Q/B from SecoLarm. 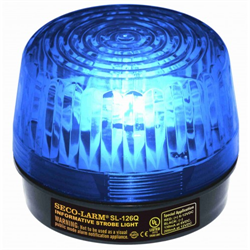 This strobe light is a budget-friendly option with a candlepower of 100 000 meaning it can be seen for miles making you home easily identifiable to the police. The strobe can easily be added to a security system with a 6-12 VDC output with a 2-wire installation. It comes with a weather resistant housing made of a high impact black ABS base and resistant acrylic lens that make it great for outdoor and indoor use. The light has an operating life of 2 000 000 flashes for 300 continuous hours.